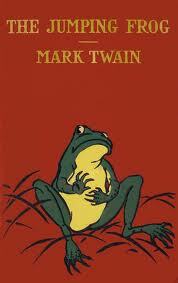 The Notorious Jumping Frog of Calaveras County Research Papers discus Mark Twain's view of society after the Civil War. Mark Twain was at the height of his writing career during the Gilded Age, or a time of extremes in which writing was based in romantic plots but contained realistic descriptions of American culture. The Notorious Jumping Frog of Calaveras County is a quintessential example of this writing style in Mark Twain’s own works. The two voices in the story illustrate with stark realism Twain’s view of society after the Civil War. Jim Smiley represents optimism but slothfully and with ignorance. The stranger represents the sector of society that is blatantly “sinful” or evil and does not hid behind an image of innocence, as does Smiley. Jim Smiley represents the romanticism of the story in his persona as the wide-eyed homeless man who would bet on anything, given the chance. He foreshadowed the vaudevillian era of American culture, which made the hobo an eclectic and romantic figure in society, and his whimsical “sins” of alcoholism and pandering were seen as humorous. Jim Smiley’s romantic characteristics include his view of his frog in which he characterizes the frog as “so modest and straightfor’ard as he was, for all he was so gifted”. This giving of human qualities to an animal is a form of romanticism and can be witnessed in other stories of this era, such as Frank, The Wizard of Oz. Ultimately, it is this suspension of reality that incorporates imaginative and non-realistic attributes to the frog that gives us such sympathy for the plight of the weighted frog and enhances the engagement of the reader to the theme of the story. It allows the reader to see how truly awful the stranger is what a monstrous personality he must be to weight the gifted and humble champion frog down with buckshot. Conversely, the stranger comes to town, looks at the frog and says, “’Well, I don’t see no p’ints about that frog that’s any better’n any other frog in Calaveras County’”. The stranger has a realistic view of the frog an fails to see the human qualities that Smiley espouses to the frog. The stranger represents realism and confronting the truth about the frog; that it was a mere frog and void of any particular distinctive breeding. The stranger saw the frog as an opportunity to cheat Smiley out of his money and he was more than happy to take the money and run. Social Class in Huckleberry Finn - Research papers from Paper Masters on social class in the novel Huckleberry Finn, by Mark Twain, illustrate that there were four main social classes outlined throughout the novel. Huckleberry Finn Themes - Huckleberry Finn Themes essays discuss the number of themes found in Mark Twain's Huckleberry Finn. Racism in Huckleberry Finn - Racism in Huckleberry Finn research papers show how Mark Twain used lighthearted satire to condemn racism. Symbolism of the Raft in Huckleberry Finn - Mark Twain, having worked the Mississippi River in his younger days on a steamboat, was intimately familiar with watercraft in Huckleberry Finn. Altering Huckleberry Finn - The current issue with Huckleberry Finn is the use of the “N” word, which Twain managed to pepper throughout the novel. Huck and Jim - Huck and Jim research papers on Mark Twain's Huckleberry Finn. Our research papers help you with understanding the relationship between Huck and Jim. Literary Canon - One of the best-known literary canons is the clear style American fiction of, established by Mark Twain. Freedom in Huckleberry Finn - Freedom in Huckleberry Finn research papers examine Mark Twain's classic. Huckleberry Finn - The Adventures of Huckleberry Finn by Mark Twain is a complex novel and an entertaining adventure. Tom Sawyer - Mark Twain’s The Adventures of Tom Sawyer research papers show that it is one of the most popular American novels of all time—“a sacred text within the body of American literature”. Paper Masters writes custom research papers on The Notorious Jumping Frog of Calaveras County and discuss Mark Twain's view of society after the Civil War.